“Mwema” singer Mercy Masika has joined a long list of other celebs with books clubs. On Sunday, the singer launched a book club at the Biblical Guest House in Kilimani. “If knowledge is power then a book is its reservoir, so we must encourage our people to read,” she added during the launch. “Even Mark Zuckerburg who is one of the greatest social media innovators of our time, has recognised the power of books and started a book club to encourage people to read.” Meaning of books The invite-only event was graced by books lovers including media personalities Gospel TV host Antony Ndiema and Dan Mwangi of NTV. The two showed their pleasure not only in books but of Masika’s event, praising her for the huge step. “It is such an amazing initiate because Africa is rising and for us to have more influence in the world, we need to read. It has been said that if you want to hide something from an African, put it in a book, and I am proud that Mercy is changing that narrative,” said Antony Ndiema. “Despite getting a D plus in school, I have built a career in ministry because of books. Life happens in seasons and there is a book for every season of life, you just have to find it and read it.”Rev Ken Aringo, who was present, added. 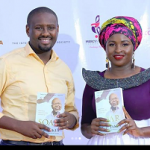 The post Mercy Masika launches a book club appeared first on Ghafla! Kenya.